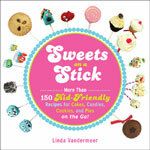 (provided info) Sweets on a Stick by Linda Vandermeer is the only cookbook that provides recipes for cakes, cookies, brownies, pies, and candies that are convenient, eye-catching, and a treat to make. You will find everything from cake pops and mini pies to cookies and marshmallow kabobs. From fruity to chocolate, crunchy to smooth, there are dozens of tasty bites to tempt your taste buds. My take on the Cookbook- Can you say easy, tasty, and FUN? If so, that is exactly what you will get with this, Sweets on a Stick cookbook. I"m a huge fan of making these type of treats and I always hear "that takes too much time" to make. Well this book really took the confusion and difficulty out of making these snacks and gave easy directions to make any reader feel like they would have enough time to make them. Most of the time when I make my cake pops, I use a boxed cake mix. Well the author provides simple, tasty homemade cake, frosting & dough recipes. They are so easy to make and are ingredients that most have right in there own pantry. Each recipe is easy to read and every step is explained. Equipment and Ingredients: Everything needed to make these goodies are listed here. Very through and most of the items are right in your own home. Cake Pops: Homemade cake & frosting recipes. Fun cake pots like Moo (milk)-Free and Gluten-Free, Abominable Snowman pops and Nutty about you pops. Cupcake Pops: These are so easy to make! Great ideas like Sunny oreo cookie bouquet, Bitty Banana Cakes with cream cheese frosting and S'more cupcakes. Cookie Pops: Wonderful cookie recipes with fun designs. Love the Play-Dough Cookies, Mustache cookies, Cowboy Hat cookie pops and Safari Mask. Outside-The-Box Pops: Very fun and super easy to pull off. Love the Popcorn balls, Dunk me donut hole pops, Brownie Blast pops and Bitty Male Waffle Bites. Cutie Pie Pops: Yummy dough recipes and fun pops like Lemon curd pie pops, Boston cream pie pops and Pirate pie pops. Fruit On A Stick: Wonderful fruit ideas like Fruity flowers, Bitty banana split bites, and Dip-and Dunk fruit. The Icing On The Cake: Full list of recipes to make all the tasty frostings, icings, sauces and a yummy marshmallow fondant. Decorating and Displaying Your Pops: Each chapter is full of fun decorating tips. This last chapter goes in to detail on items needed, where to buy and crafty tips! This book was made by a busy mom! After reading this book, I was inspired to make fun treats including marshmallow pops. I made some chocolate ones using pretzels as a stick and Valentine Pops! Pick up this book today for some quick & easy Sweets on a Stick! Feeling lucky? Enter the super easy giveaway below to try and win a copy! Linda Vandermeer started cooking with her mother as a child and now encourages her three children to help her in the kitchen. Inspired by their creativity, she started her blog BubbleandSweet.blogspot.com, which features all of her delectable creations. Her recipes have been published in Peekaboo Magazine and Adore magazine. A stay-at-home mom, she lives with her husband and three children. 1)Line a tray with parchment paper. 2)In a microwave-safe bowl, melt the candy coating by heating at med. low in 60 second burst, stirring in between burst for a total of 4-6 minutes, until all the coating is smooth and lump free. 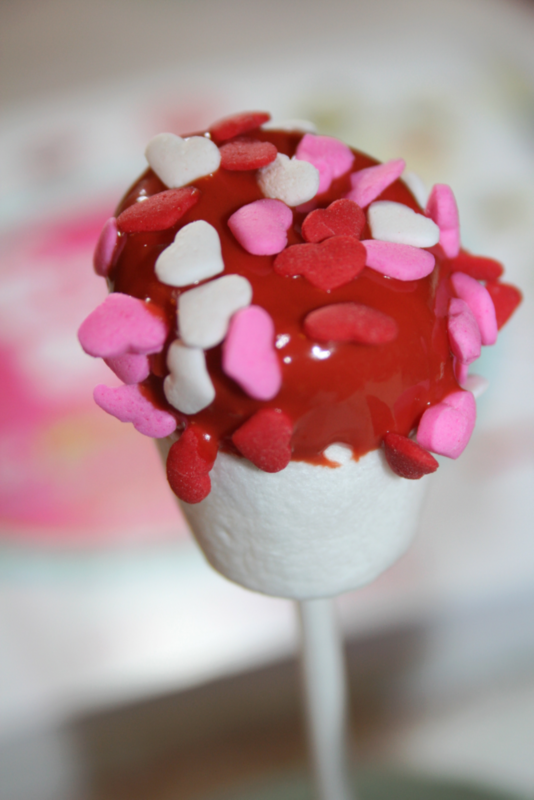 3) Dip the end of the lollipop sticks into the melted candy and insert into the marshmallows. Allow to set for 10 minutes. 4) Remelt the candy coating if necessary. Holding the end of the stick, dip the top of a marshmallow into the melted candy and then lift it out. Holding the pop over the bowl to catch drips, gently tab the stick against your hand or the side of the bowl to remove excess candy coating. 5) Move the pop away from the bowl. Working quickly, before the candy sets, shake the sprinkles over the candy-coated marshmallows. Stick the pop upright into a Styrofoam block to set. Repeat for remaining pops. Kitchen Notes- I took creative license and used red candy coating. These will make great Valentine treats. I was sent a copy of this cookbook by the sponsor for my participation in the Sweets On a Stick blog tour. My own tasty opinions are expressed here. To win- Leave a comment and tell me why you want this book! Bonus entries- Follow me on Pinterest, Twitter or Facebook. Give this post a pin on Pinterest. You'll get one entry for each one you do. Leave a comment so that I know which entries you completed! What a great idea.... I love fast and easy things that make you look like a rock star. I love cookbooks, especially cookbooks about sweets stuff! I could make so many fun things! These would be such a help in making items for the young kids in my family birthdays. It looks like so many fun and tasty treats to make for and with my family!! I would love to have this book to make a "sweets" birthday party for my daughter and let them make their own "sticks"!!! I want to win this book to use it to make things together with my daughter. I love the marshmallow pop!! Love trying new things for the kids! and marshmallow almost low fat in my mind ;> I am following you on FB and Pinterest!!! LOVE ALL THE IDEAS!! I love to give gifts and this is a wonderful idea to have for great gifts. 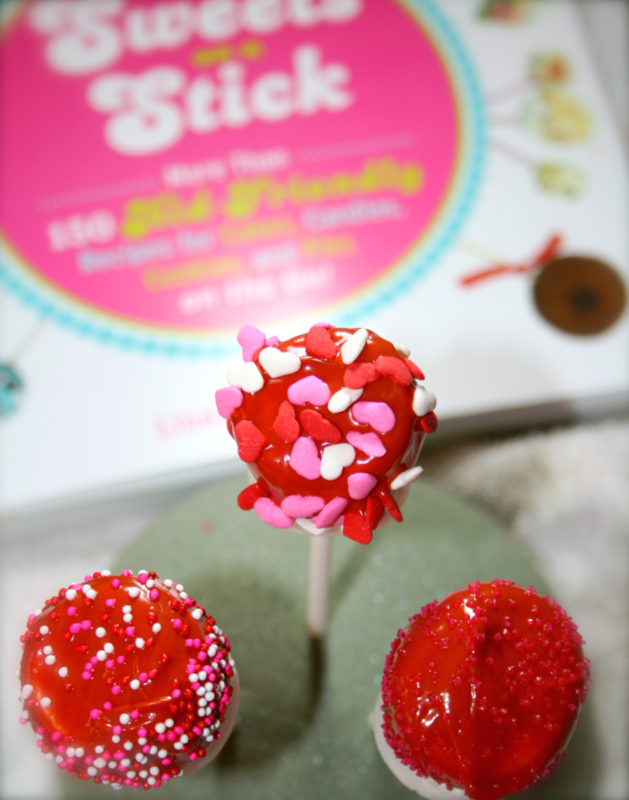 I love to eat sweets on sticks :) I added you on facebeook & Pinterest! !